European Tour — Kevin Phelan slipped 22 spots to tied 36th as Javier Colomo made history in the AfrAsia Bank Mauritius Open. The Mount Juliet touring professional is on one under par after a two over par 73 in round two, eight strokes adrift of Thorbjorn, who continued to shine on his return from injury. The first tri-sanctioned event between the European, Asian and Sunshine Tours will go down in the record books for another reason after Spaniard Colomo became the first player in the history of The European Tour to record a hole in one on a par four, courtesy of a dramatic albatross on his closing hole, the 322 yard ninth. Remarkably, after dropping a shot on the previous hole, Colomo had needed a birdie to make the weekend, and his boldness with the driver off the tee paid off in the most spectacular way, as he finished two shots inside the cut after signing for a round of 69 and a one under par total. Playing in his first tournament back after three months out following corrective surgery to tendons in his left hand, Olesen followed an opening round of 65 with a second round 68 to move to nine under par at the Heritage Golf Club, with Sweden’s Pelle Edberg his closest rival on eight under par following a 66. Javier Colomo celebrates his albatross. Challenge Tour — Ruaidhri McGee was the only Irish player to make the cut in the Turkish Airlines Challenge. As Edouard Dubois extended his overnight lead, continuing his remarkable form on the par fives with two further eagles to move three clear at the top on 11 under, McGee shot a one under 71 to make the cut on level par at Gloria Golf Club in Antalya. On a day when play was suspended for 55 minutes due to the threat of lightning, two-time Challenge Tour winner Dubois was lucky enough to have signed his card before the klaxons were sounded, but there was nothing lucky about his five under par round of 67. After an opening 66 which included two eagles and two birdies at the par fives, Dubois recorded two more eagles – on two different long holes this time, the fifth and the twelfth – and another birdie at the first to bring his total score over the par fives this week to an incredible 11 under par. On a lay-out in which all of the par fives are reachable in two, the 26 year old predicted after his opening round that they would play a big part in who emerges victorious this week, so he was delighted to take advantage of that and remain in pole position heading into the weekend. Simon Thornton (71-74) missed the cut by one with Gareth Maybin (75-71) on two over and Headfort's Rory McNamara (76-71) three shots outside the mark on three over on his debut in a European Challenge Tour event. Birr's Stephen Grant (75-73) ended the week on five over to miss the cut. But that was only part of the story. The 38-yeartold former footballer, who was already under pressure after breaking his driver in practice, then incurred a two stroke penalty before the start when he went to the wrong tee. Believing he was off the first at 12.15, he arrived 15 minutes early only to discover his mistake. He then headed for the 9th for what was, usually, a 12:00 start but got there at 12.01. He was still first to hit but couldn't avoid the two-stroke penalty and after starting with a double bogey seven, it was an uphill struggle from here. Kevin Phelan fired a super 65 to move back inside the crucial Top 25 at the halfway point of the European Tour Qualifying School Final Stage in Catalonia. Challenge Tour — Rosapenna's Ruaidhri McGee stormed home in 30 to move up to within five of former European Tour winner Rhys Davies the Turkish Airlines Challenge. Kevin Phelan produced a red hot finish to scorch up the leaderboard in the AfrAsia Bank Mauritius Open. 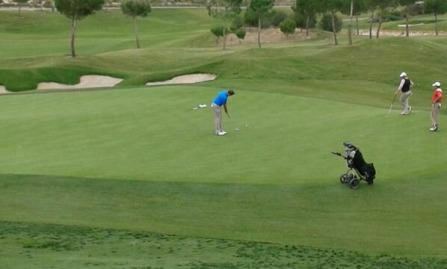 Ruaidhri McGee in action in round three at Las Colinas. Picture courtesy https://twitter.com/gmacespanyaRosapenna’s Ruaidhri McGee and Waterford Castle’s Kevin Phelan are inside the magic number with a round to go at the European Tour Qualifying School Second Stage in Spain.